One may say that, apart from wars and revolutions, there is nothing in our modern civilizations which compares in importance to [inflation]. The upheavals caused by inflations are so profound that people prefer to hush them up and conceal them. With the worldwide collapse of socialism as an economic system, Marxism today stands thoroughly discredited as an intellectual position. Made prophetically early in this Ludwig von Mises's claim that economic calculation is impossible in the absence of free markets has been vindicated by the manifest failure of Soviet communism. Decisively refuted by the facts of economic life, Marxism has been forced to retreat to the one place in the academy where empirical reality seems to carry no weight in an argument: the humanities departments. As has often been noted, the great paradox of academic life at the moment is that just when Marxism has lost all credibility in the practical world, it has come to dominate the study of the humanities in American universities. Deconstruction and other forms of poststructuralism prepared the way for this outcome. By calling into question any notion of truth and objectivity, these movements in literary theory left humanities departments vulnerable to the lingering bewitchment of Marxism in a way to which other disciplines more in touch with reality have been comparatively immune. Setting aside the fact that a lot of equally brave men and women died fighting against socialism, we can see in Rorty's statement the danger of allowing socialism to retain its claims to the moral high ground. One way of salvaging the cause of socialism is to insist that, however much a failure it may have been as an economic alternative to capitalism, it still provides a kind of ethical alternative in some vaguely humanistic sense. Set in Weimar Germany during the time of the hyperinflation, this story takes on new meaning once it is analyzed in terms of Mises's theory of inflation and the crack-up boom. With Mann's uncanny ability to mirror economic and social reality in his fiction, he succeeds even without any knowledge of Austrian economics in bringing out the psychological ramifications of an inflationary environment with a subtlety of insight Mises would have admired. Moreover, as we analyze "Disorder and Early Sorrow" in light of Mises's theory of inflation, we will see that the story has larger implications for our view of twentieth-century cultural history. A reading of Mann in terms of Austrian theory helps to uncover a connection between the economic facts of the twentieth century and the very poststructuralist ideas that have given Marxism a second life in today's humanities departments. In short, I hope to show that, despite all indications to the contrary from my colleagues, it is possible to talk about literature and still make economic sense. At first sight, "Disorder and Early Sorrow" may appear too insubstantial a story to bear up under the weight of any kind of sustained analysis.3 Mann tells the tale of an apparently average day in the life of Dr. Abel Cornelius, a professor of history. His teenage children, Ingrid and Bert, are holding a party for their friends, a typical cross section of youthful acquaintances, including students and entertainers. Everyone enjoys the party, especially the professor's younger children, Ellie and Snapper, who relish the opportunity to spend time with the grownups. Finding his routine disturbed by the presence of all the young people, the professor is nevertheless in some ways attracted to them and their modern way of life. He wanders in and out of the party, tries to get some work done in his study, and eventually goes out for his daily walk. He returns to find his house in an uproar. His five-year old daughter is throwing a tantrum, as a result of feeling spurned by an engineering student named Max Hergesell, for whom she rather precociously developed a crush while he playfully danced with her. Upset that Hergesell cannot be her brother, little Ellie is not consoled until Max gallantly comes to her room to wish her good night, thus bringing the tale to a close with a poignant hope of innocence restored. Though seemingly slim in substance, "Disorder and Early Sorrow" presents the kind of world familiar to us from the great texts of literary modernism, such as Eliot's The Waste Land or Mann's own "Death in Venice." The story charts the dissolution of authority, as we watch a social order breaking down and see the confusions that result. In particular, Mann portrays a world in which parents are losing their authority over their children. Obviously viewing their parents as old fogies, the children think of their generation as smarter than the preceding one. Mann portrays a world that has gone mad in the worship of youth. As a sign of the resulting confusion, we are introduced to the "big folk" (die Grossen) in the first paragraph (p. 179), only to discover in the second that the term applies to the teenagers, not, as one would expect, to their parents. The little children already call their father by his first name. As a story of people growing up too fast, "Disorder and Early Sorrow" appropriately concludes with the incident of Ellie's infatuation with Max. The image of a five-year old girl having her first love affair becomes Mann's way of crystallizing our sense of the absurd pace of development in this world. When an actor named Ivan Herzl shows up at the party in heavy makeup, he provokes Cornelius into thinking about how people no longer are what they seem: "You would think a man would be one thing or the other — not melancholic and use face paint at the same time" (p. 196). Mann creates a pervasive sense of inauthenticity in the story; the modern world is a counterfeit world. Thus like The Waste Land, "Disorder and Early Sorrow" counterpoints the coherence of past eras with the incoherence of modern times. If modernity is characterized by a loss of the sense of the real, this fact is connected to what has happened to money in the twentieth century. Everything threatens to become unreal once money ceases to be real. I said that a strong sense of counterfeit reality prevails in "Disorder and Early Sorrow." That fact is ultimately to be traced to the biggest counterfeiter of them all — the government and its printing presses. Hyperinflation occurs when a government starts printing all the money it wants, that is to say, when the government becomes a counterfeiter. Inflation is that moment when as a result of government action the distinction between real money and fake money begins to dissolve. That is why inflation has such a corrosive effect on society. Money is one of the primary measures of value in any society, perhaps the primary one, the principal repository of value. As such, money is a central source of stability, continuity, and coherence in any community. Hence to tamper with the basic money supply is to tamper with a community's sense of value. By making money worthless, inflation threatens to undermine and dissolve all sense of value in a society. Thus Mann suggests a connection between inflation and nihilism. Perhaps in no society has nihilism ever been as prevalent an attitude as it was in Weimar Germany; it was reflected in all the arts, and ultimately in politics. It would of course be wrong to view this nihilism as solely the product of an inflationary environment. Obviously Weimar Germany faced many other problems, some the legacy of World War I and the Treaty of Versailles, some the legacy of nineteenth-century German thinkers such as Nietzsche. But as Mann's story reminds us, we should not underestimate the role of inflation in creating the pervasive sense of nihilism in Weimar Germany. A glance at the back of an American dollar bill shows two phrases: "United States of America" and "In God We Trust." Somehow our money is connected with our political and even our religious beliefs. Shake a people's faith in their money, and you will shake their other faiths as well. This problem has become particularly acute in the twentieth century, because ours is the age of paper money, money that has to be taken on faith alone. That is why we have to put "In God We Trust" on the back of our dollars; nobody really trusts the Chairman of the Federal Reserve. In "Disorder and Early Sorrow," Mann invites us to consider what happens to our lives when we are forced to take our money purely on faith and that faith is betrayed by the government. Financial details chronicling the absurdity of hyperinflation are scattered throughout the story. Cornelius is making a million marks a month, and that is merely "more or less adequate to the chances and changes of post-war life" (p. 182). Here Mann presents the characteristic inauthenticity of the world he is portraying as a direct response to government intervention in the market, which forces people to become fakes. With the value of money diminishing virtually hour by hour, people desperately search for some way to hold on to value, and that means they rush to exchange their largely fictitious money for something real, a real good. Thus inflation serves to heighten the already frantic pace of modern life, a pace that further disorients people and undermines whatever sense of stability they may still have. A society composed of embittered people like the Hinterhofers is soon going to face major political problems, as the rise of fascism in Germany was to show. Mann is as acute in portraying the psychological effects of inflation as he is in portraying the economic, social and political effects. As he shows, inflation fundamentally changes the way people think, forcing them to live for the moment. There is no use planning for the future, since inflation, especially hyperinflation, makes future conditions uncertain and unpredictable. As Mises demonstrated, the most insidious effect of inflation is that it makes economic calculation nearly impossible. It thereby destroys the Protestant ethic, which ever since Max Weber has been viewed as linked to capitalism. What is the use of saving one's money if that money will soon become worthless as a result of inflation? As Mann shows, in an inflationary environment, the rational strategy is to spend your money as fast as you make it. Thus inflation works to shorten everyone's time horizons, destroying precisely those attitudes and habits that normally make the middle class hard workers and prudent investors, those forces that lead them to restrict their present consumption for the sake of increasing future production. Mann notes that inflation even changes the way people dress, but, more importantly, he sees that it alters the dynamic between the generations in society, giving the young a huge advantage over the old. Not having experienced economic stability, the youth of Germany are more able to go with the inflationary flow. In a world in which the young are leaping into the future two days at a time, the old become increasingly irrelevant. Economists have long recognized that inflation is particularly cruel to the elderly in society, especially retired people who live on fixed incomes, which cannot keep pace with inflation. Mann fills in our sense of the psychological disruptions that accompany the economic ravages of inflation. More than any other factor, inflation discredits the authority of the older generation and turns power over to youth. It is not simply a matter of the old losing their economic advantage over the young. In an inflationary environment, all the normal virtues of the old suddenly start to work against them, while all the normal vices of the young suddenly seem to look like wisdom. Conservatism and a sense of tradition make it impossible to respond to rapidly changing economic conditions, while the profligacy of youth becomes paradoxically a kind of prudence in an inflationary environment. Mann's genius is to show how all the characteristics of the world in "Disorder and Early Sorrow" flow from the new economic facts of life. One still needs to turn to economists like Mises to understand the causes and the full economic ramifications of inflation. But what Mann does for us is to show the human reality of the phenomenon, how it alters not just economic conditions but the very fabric of everyday life, right down to the psyches of young children.12 Ellie's premature infatuation with Max is the emotional equivalent of inflation. We are all familiar with this kind of food substitute, an artificial product that is always presented as superior to the real thing, but that is in fact merely cheaper (and perhaps less fattening). Such substitutes are characteristic of life in the twentieth century, and Germany, with its advanced chemical industry, led the way in developing them, so much so that we have taken the German word for substitute, Ersatz, into our language. The artificially heightened pace of the inflationary economy produces more and more irrationalities, including increasing deception in the marketing of commodities. Much of what is traditionally and mistakenly regarded as the duplicity of capitalism is in fact the result of government intervention in the market in the form of tampering with the money supply. AB Mann shows, it is primarily the government-induced process of inflation that eats away at the substance of reality in the modern world. Thus even before the paper money inflations of the twentieth century, one could detect a movement of the modern economy toward the simulacrum in place of the real thing. De Tocqueville reminds us that economic developments often have political causes, and many of the tendencies Mann portrays in "Disorder and Early Sorrow" can be attributed to the abrupt democratization of Germany after World War I. But Mann shows how inflation works to hasten and heighten these tendencies, forcing people to economize by accepting substitutes in a desperate attempt to maintain the shadow of their former standard of living. The telephone is an example of how the modern communication media create an illusion, the illusion of immediacy. Bert and Ingrid enjoy the sensation of seeming to be in touch with the great public figures of their day, but in a sense, they are as much deceived as the people they try to fool. They think that they are dealing directly with these famous people, but in fact the telephone stands inbetween them; otherwise their deception would not work. Thus any relationship they establish over the phone is inevitably phony; as the German idiom for "wrong number" more forcefully suggests, they are "falsch verbunden" (p. 624), falsely connected. In a telephone conversation, one does not see the person one is talking to, but has the illusion of being in his presence. Similarly, in a paper money economy, one does not see gold anymore, but the currency gives the illusion of the presence of wealth. The increasingly mediated character of the modern economy, especially the development of sophisticated financial instruments, allows the government to deceive its people about the nature of its monetary policy. When a government tries to clip coins or debase a metal currency, the results are readily apparent to most people. By contrast, the financial intermediation involved in modern central banking systems helps to shroud monetary conditions in mystery. At least initially the techniques of deficit financing and monetarization of debt conceal from the public what is happening to the money supply. Just as the jokes of Bert and Ingrid work only because the people they call cannot see them, the Weimar government's inflation worked only because it was hidden behind the smokescreen of modern central banking; with paper money one cannot at first see how the currency is being debased. As Mises has shown, the whole of inflationary policy depends on the confusion in any system of indirect exchange between money and capital, the illusion that pieces of paper are somehow really wealth. Here Mann anticipates what was to become the Hollywood myth of being discovered in Schwab's drugstore. Such dreams are bred by an inflationary economy, which thereby corrupts the ambitions of youth. The young man fantasizes about making his fortune in the movies because he can only imagine becoming wealthy by making one big killing. In an inflationary environment, one must dream of becoming an overnight success because the slow steady way of amassing a fortune by working hard simply will not work. As Mann senses, the moving picture is the perfect art form for the age of inflation: a kinetic art for a kinetic era. He shows how the movies are already saturating everyday life; in his choice of cigarettes, Xaver smokes "a brand named after a popular cinema star" (p. 180). In the illusory world fostered by inflation, an image on a screen now works to shape a man's desires. In a case like this it is difficult to speak of cause-and-effect. It would be simplistic to make a statement like: "Because we went off the gold standard, modern art became non-representational." One suspects that both developments have their roots in something deeper in modern life and modern culture, perhaps the democratization de Tocqueville traces. Still, it is worth considering that a change as fundamental as the switch from a commodity-based currency to fiat money might have widespread implications for a society, and might even affect basic cultural attitudes. If self-referentiality is really a defining characteristic of modern art, then perhaps the inflationary environment created by twentieth-century governments at least helped to foster the sense of irreality that pervades our culture. As money ceases to refer to anything real anymore, the traditional idea of referentiality is undermined. The architects of inflationary policy are to blame for many of the disasters, economic and political, of this century. "Disorder and Early Sorrow" suggests that we may also hold them responsible for the empty self-referentiality of much modern art. I can offer one particularly apt example to try to corroborate the connection I have been drawing between the epistemology of twentieth-century art and debates over paper money. At the core of post-modernism is the tendency to make the act of representation problematic. Postmodern images call attention to themselves, to the fact that they are merely images. In traditional art, the medium is, as it were, transparent; the artist wants us to look through his act of representation to the thing being represented, and hence does everything possible not to call our attention to his medium. But the postmodern artist throws a wrench into the process of representation, foregrounding his medium and thus making us concentrate on the act of representation itself, on the fact that we are watching something being represented. A famous example of this technique among the Surrealists, forerunners in many respects of postmodernism, is Rene Magritte's The Treachery of Images (Fig. 1). One of the many ways of reading the inscription on this clever painting is: "This is not a pipe; this is merely a representation of a pipe." Magritte short-circuits any tendency we might have to confuse the representation of a thing with the thing itself by explicitly calling attention to his act of representing the thing.23 The painting leaves us with a lingering sense of the inadequacy and even the duplicity of all acts of representation. Source: Original title La Trahison des Images (Ceci n'est pas une Pipe). René Magritte. Oil on canvas 60 x 81.3 cm. Los Angeles County Museum of Art. Magritte's painting, done in 1928–29, seems a perfect example of avant-garde art, the kind of work that could only be produced in the twentieth century. And yet it bears a striking resemblance to a famous cartoon by Thomas Nast, drawn as an illustration to David Wells's book, Robinson Crusoe's Money, first published in 1876 (Fig. 2). Wells's book was an attack on the paper money inflation brought about by the Civil War. He uses a Crusoe fable to expose the folly of the common people's belief in the reality of paper money. Source: David Wells, Robinson Crusoe's Money; or, the Remarkable Financial Fortunes and Misfortunes of a Remote Island Community (New York: Harper & Brothers, 1876), p. 57. "Disorder and Early Sorrow" may be just a short story, but, as I have tried to show, it is remarkable how complete a portrait of the modern world Mann is able to pack into this brief work, and how rich it is in economic detail. With his attention to the consequences of inflation for daily life, Mann provides a useful supplement to Mises's brilliant economic analysis of the phenomenon. Mises explains what happened in Weimar Germany; Mann gives a sense of how it felt to ordinary people, and in that way may help to convince his readers of the full horror of inflation. Though it may be a rare case, I offer this discussion of "Disorder and Early Sorrow" as an example of how an economic but non-Marxist analysis of literature is possible. Only if one approaches the story armed with the correct analysis of inflation supplied by Mises can one see what its true significance is and what its larger implications are. What is particularly interesting about the story is that it portrays the same world that modernist texts usually do, but offers a different explanation of the characteristics of that world. Mann traces the feeling of modern man that the ground has been pulled out from beneath his feet, not to some metaphysical principle of human life itself, but to the effects of a specific government policy, namely inflation. Moreover, he suggests that the inauthenticity of modern life, which has often been blamed on capitalist practices such as advertising, is more properly viewed as the result of the inflationary environment created by government. The Marxist critics who today dominate humanities departments act as if all economic analysis of literature must yield (for them) comfortingly leftwing conclusions. An Austrian economic analysis of "Disorder and Early Sorrow" shows that many of the problems characteristic of modern life are not, as literary critics tend to claim, the product of private enterprise, but rather of that very government intervention in the economy Marxists always recommend. The twentieth century could be called the Age of Inflation,27 the Age of Paper Money, and "Disorder and Early Sorrow" suggests how this fact is related to the prevailing sense of inauthenticity in our time, the sense of a lack of reality and a loss of value. Critics often search as if puzzled to answer the question: how could authors such as Kafka come up with a view of the world as so absurd? The fact is that in its day-to-day consequences the German inflation of the 1920s was far more absurd than anything Kafka could dream up. When Gregor Samsa turns into an insect, it certainly introduces an element of craziness into his household, but at least the money his parents put away in the bank retained its value and allowed life to go on for his family, and when his sister went to do the shopping, she did not need a wheelbarrow to carry the banknotes necessary just to buy a loaf of bread. It would of course be wrong to blame the development of the idea of the Absurd in modern literature purely on inflation. After all, we can find the Absurd in the literature of countries which never went through anything like the German hyperinflation (though it would be impossible to find any country in this century unaffected by inflation, not even Switzerland; in the modern world, we are always talking only about relative rates of inflation; inflation is the most pervasive economic fact of our time). Still, "Disorder and Early Sorrow" gives us much food for thought, and leads us to ask how much of an impact this all-pervasive economic phenomenon has had on modern literature and ways of thinking. Taking our cue from Mann, we begin to question whether inflation may in fact be an even more insidious phenomenon than we have realized, fundamentally altering our world and the way we view it. Thus in a way very different from Marxist approaches,28 Mann suggests a connection between the spiritual history of the twentieth century and the economic, making us wonder whether the world became merely an image when money became merely an image. As I said at the beginning, deconstructionist and poststructuralist theories paved the way for Marxist takeovers of humanities departments by calling into question any standards of truth and reality, and thus making the demonstrable failure of socialist economic policies in the real world seem irrelevant in the thinking of literature professors. But analysis of "Disorder and Early Sorrow" suggests that these very theories do not, as they claim, provide insight into the human condition as such, but are in fact just a response to specific economic conditions in the twentieth century, the Age of Inflation. Theorists who triumphantly proclaim the illusoriness of human existence are merely reflecting the world created by government monetary policy, the web of illusions endemic to the era of paper money. In a strange way, one may say that Foucault, Derrida, and the other poststructuralists are right; they have evolved a philosophy appropriate to the Age of Inflation, the age when money itself comes to represent nothing, and hence all representation becomes problematic. The mistake occurs when these philosophers universalize from their limited historical experience, and see the world brought about by Keynesian economics as co-extensive with human life in general. Reading Mann's story can help remind us that it is not human life as such that is unreal — it is the money our governments have surreptitiously imposed upon us in an inflationary policy that has caused our sense of reality itself to attenuate in the twentieth century. 2. I quote "Disorder and Early Sorrow" in the translation of H. T. Lowe-Porter, from Thomas Mann, Death in Venice and Seven Other Stories (New York: Vintage, 1989). When referring to the German original, I quote from Thomas Mann, Gesammelte Werke 13 vols. (Frankfurt: S. Fischer, 1974), vol. 8. Lowe-Porter's translation is filled with minor errors, omissions, and additions, which I have not bothered to correct, except where they have a bearing on interpreting Mann's intentions. 3. Although "Disorder and Early Sorrow," is frequently referred to as a novella, and has many of the characteristics of the form, it seems to me brief enough to be properly called a short story. As for its seeming lack of substance, Henry Hatfield, for example, rather patronizingly says that the story "is one of Mann's less ambitious pieces, yet within its limits one of his most successful." See Henry Hatfield, Thomas Mann (Norfolk, Conn.: New Directions, 1951), p. 87. Although "Disorder and Early Sorrow" has been popular with readers, and is frequently anthologized, it has attracted little attention from critics. Few essays have been devoted to it specifically, and most general studies of Mann mention it only in passing. If they discuss it at all, critics usually choose to concentrate on the autobiographical aspects of the story. Evidently Mann based the story largely on a party actually given in his own household in Munich. See the account of his son: Michael Mann, "Truth and Poetry in Thomas Mann's Work" in Thomas Mann, Harold Bloom, ed. (New York: Chelsea House, 1986), pp. 292–93. Some critics discuss the Freudian implications of the relationship between the father and the daughter in the story. Herbert Lehnert develops a brief but interesting interpretation of the story as involving an inversion of the structure of The Magic Mountain; see Thomas Mann: Fiktion, Mythos, Religion, 2nd ed. (Stuttgart: W. Kohlhammer, 1968), p. 97. 4. Though some critics acknowledge in passing the fact that "Disorder and Early Sorrow" is set in the time of the German inflation, it is surprising how little critics make of the importance of economic factors in the story. Hans Eichner, Thomas Mann: Eine Einführung in Sein Werk (München: Lehnen, 1953), p. 64, relates Ellie's tantrum to "die allgemeine Verwirrung der Inflationsjahre" ("the general confusion of the inflation years"), but says nothing further. The fullest discussion in English of the story I have been able to locate mentions inflation just once, and then as only one of many examples of disorder in the story. See Sidney Bolkovsky, "Thomas Mann's 'Disorder and Early Sorrow': The Writer as Social Critic," Contemporary Literature 22 (1981): 221. In a brief essay on the story, Mann himself stressed its personal and psychological elements, but he also expressed his satisfaction that it had appeared in French translation under the title "Au temps de l'inflation," which he says is in accord with the author's intention and meaning ("nach des Verfassers Absicht und Meinung"). He was happy that in foreign countries the story was being understood as "a document of middle-class German life after the war" ("als Dokument deutsch-bürgerlichen Nachkriegsleben"). See "Unordnung und frühes Leid," Gesammelte Werke, 11: 621. When Mann described the story in a letter, he called it: "'Unordnung und frühes Leid,' eine Inflations-geschichte" ("a history of inflation" or "an inflation story"). Letter to Hans Heinrich Borcherdt, March 3, 1926, as quoted in Esther H. Leser, Thomas Mann's Short Fiction: An Intellectual Biography (Rutherford, N.J.: Fairleigh Dickinson University Press, 1989), p. 304, n. 50. 5. The terms hyperreality and hyperrealism originated in art criticism. They refer unreal. The terms have been given a broader meaning in contemporary discourse by such writers as Jean Baudrillard, who sees the whole world we live in as hyperrealistic in its pervasive artificiality: "The unreal is no longer that of dream or of fantasy, ... it is that of a hallucinatory resemblance of the real with itself"; "It is reality itself today that is hyperrealist" (italics in the original). See Jean Baudrillard, Simulations, Paul Foss, Paul Patton, and Philip Beitchman, trans. (New York: Semiotext[e], 1983), pp. 142, 147. For a more popular account of the contemporary idea of hyperrealism, see Umberto Eco, Travels in Hyperreality, William Weaver, trans. (New York: Harcourt Brace, 1986), pp. 3–58. 6. For example, in his influential and widely praised study, Weimar Culture (New York: Harper & Row, 1968), the historian Peter Gay typically mistakes the effects of inflation for the causes: in his view the Weimar inflation was "caused by a shortage of gold, adverse balance of payments, and the flight of capital" (p. 152); only later in his account does he even refer, and then merely in passing, to the government's "printing of money" (p. 154). For a recent historical account of Weimar Germany that confirms the Austrian theory of the inflation, see Stephen A. Schuker, American "Reparations" to Germany, 1919–33: Implications for the Third-World Debt Crisis (Princeton, N. J.: Princeton University Press, 1988), p. 20: "a budget deficit that could not be financed except through the issue of floating debt discounted by the Reichsbank represented the real engine of inflation." 7. The relevant passage in Macaulay can be found in Chapter 19 of his History of England. See The Works of Lord Macaulay (London: Longmans Green, 1898), vol. 5, pp. 335–49. That Mann had recently been reading this section when he wrote "Disorder and Early Sorrow" is suggested by a verbal echo; at one point Macaulay speaks of "the lamp of Aladdin" (p. 346), while in the German Mann refers to "Aladin mit der Wunderlampe" (p. 646); the parallel seems weaker in the translation, where Lowe-Porter merely speaks of "Alladin" (p. 204). In this section of his history, Macaulay discusses the moment when the British Parliament created the national debt to deal with the budget deficits it had incurred, chiefly in financing wars. Mann undoubtedly saw the parallels to the situation in Germany after World War I. Macaulay praises deficit financing as a wonderful contrivance for national prosperity; Mann had less cause to be this sanguine about its effects. 8. In German, "die Flucht in die Sachwerte"; see Ludwig von Mises, Human Action (New Haven, Conn.: Yale University Press, 1949), p. 424. 9. The German here is more specific — the character is a Börsenspekulant, a "stock market speculator" (p. 646). 10. It may seem extreme to blame the rise of Hitler on the German inflation, but for an insightful discussion of the connection between inflation and Nazism, see Elias Canetti, Crowds and Power, Carol Stewart, trans. (New York: Seabury, 1978), esp. pp. 187–88. Canetti even links the devaluation of human life represented by the Holocaust directly to the German inflation. For Mises's own frank account of Weimar politics, and the role of inflation in the rise of Nazism, see his Omnipotent Government: The Rise of the Total State and Total War (New Haven, Conn.: Yale University Press, 1944), pp. 193–228. 11. Here the English translation is in some ways more appropriate than the original German. Mann has Cornelius speak of Xaver as Festordner (p. 645), "master of ceremonies," not "minute-man." 12. Mann was of course not the only writer of his day who portrayed the effects of inflation, though it is surprising how little attention literary critics have paid to this phenomenon. I have been able to locate only one brief article that deals with the depiction of the 1920s inflation in literature; appropriately it treats Austrian authors. See Friedrich Achberger, "Die Inflation und die zeitgenössische Literatur," in Aufbruch und Untergang: Österreichische Kultur zwischen 1918 und 1938, Franz Kadrnoska, ed. (Vienna: Europa, 1981), pp. 29–42. Achberger lists 33 Austrian literary works with the inflation as their theme, including works by such well-known authors as Heimito von Doderer, Robert Musil, and Stefan Zweig. From Achberger's descriptions, these works evidently have much in common with "Disorder and Early Sorrow." Achbergermentions that Mann's brother, Heinrich, also wrote a novella dealing with the inflation period called Kobes (1925); Hugo Stinnes, the German industrialist who profited heavily from the inflation, provides the model for this work. Rolf Linn remarks: "This makes 'Kobes' unique, for the vast literature about the turbulent post-war years in Germany — all but forgotten with the exception of Thomas Mann's 'Disorder and Early Sorrow' — deals largely with the victims of the rapid devaluation of the mark." See Rolf Linn, Heinrich Mann (New York: Twayne, 1967), p. 83. 13. An interesting literary parallel can be found in the third part of Hermann Broch's trilogy The Sleepwalkers, Willa and Edwin Muir, trans. (New York: Grosset & Dunlap, 1964). His character Huguenau finds his world unhinged by the process of inflation: "Currency hitherto accepted becomes incalculable, standards fluctuate, and, in spite of all the explanations that can be adduced to account for the irrational, what is finite fails to keep pace with the infinite and no reasonable means avail to reduce the irrational uncertainty of the infinite to sense and reason again" (p. 640). Economics had represented the world of rationality to Huguenau, but inflation turns that rationality into irrationality: "even that most characteristic mode of the bourgeois existence, that partial system which is hardier than all others because it promises an unshakable unity in the world, the unity that man needs to reassure his uncertainty — two marks are always more than one mark and a sum of eight thousand francs is made up of many francs and yet is a whole, a rational organon in terms of which the world can be reckoned up — even that hardy and enduring growth, in which the bourgeois desires so strongly to believe even while all currencies are tottering, is beginning to wither away; the irrational cannot be kept out at any point, and no vision of the world can any longer be reduced to a sum in rational addition" (p. 641). 14. The German original (p. 618) is much stronger in conveying a sense of impoverishment; it should be translated: "As main course there were only vegetables, cabbage-cutlets; after that followed a Flammeri, composed out of one of those pudding powders one buys now, that taste like almond and soap." A Flammeri is a blanc-mange or trifle, but the word also conveys the sense of flummery or deception. Mann uses Flammeri in precisely that sense a few pages later (p. 621). 15. Alexis de Tocqueville, Democracy in America, Henry Reeve, Francis Bowen, and Phillips Bradley, eds. (New York: Vintage, 1959), vol. 2, p. 53. De Tocqueville illustrates this principle with a personal anecdote: "When I arrived for the first time in New York ... I was surprised to perceive along the shore ... a number of little palaces of white marble, several of which were of classic architecture. When I went the next day to inspect more closely one which had particularly attracted my notice, I found that its walls were of whitewashed brick, and its columns of painted wood. All the edifices that I had admired the night before were of the same kind" (p. 54). For further thoughts on the connection between democracy and the simulacrum, see Baudrillard, pp. 78–79. Contemporary French thinkers might be surprised to learn how many of their ideas were anticipated by their aristocratic countryman in the nineteenth century. 16. To be sure, as long as people have faith in a paper currency, it can be exchanged for real commodities, and in that sense can still be said to represent value. But as the quick collapse of paper currencies like that of Weimar Germany shows, their "reality" is highly attenuated compared to that of gold-backed currencies. 17. Consider in this context Samuel Beckett's famous formulation of the non-representational character of modern art: "there is nothing to express, nothing with which to express, nothing from which to express, no power to express, no desire to express, together with the obligation to express." See Samuel Beckett, "Three Dialogues," Disjecta (New York: Grove, 1984), p. 139. With one substitution, this passage becomes an excellent characterization of the world of paper money as legal tender: "there is nothing to exchange, nothing with which to exchange, nothing from which to exchange, no power to exchange, no desire to exchange, together with the obligation to exchange." 18. In The Post-Modern Aura: The Act of Fiction in an Age of Inflation (Evanston, Ill.: Northwestern University Press, 1985), Charles Newman attempts to relate postmodernism to the prevalence of inflation in the twentieth century. This book is the most serious attempt I know of to discuss the cultural implications of inflation; see especially pp. 6–7, 187–90, or his summary statement (p. 184): "In cultural matters, inflation abstracts anxiety, suspends judgment, multiplies interpretation, diffuses rebellion, debases standards, dissipates energy, mutes confrontation, undermines institutions, subordinates techniques, polarizes theory, dilates style, dilutes content, hyperpluralizes the political and social order while homogenizing culture. Above all, inflation masks stasis." Unfortunately the book is seriously weakened by Newman's inability to develop a sustained argument; he comes up with some brilliant insights, but fails to develop them systematically. He is also woefully ignorant of economic truth, especially about the nature of inflation, which he claims "is primarily caused not by ... monetary policy or government spending ... but by inflationary assumptions anticipated by the entire culture" (p. 167), another case of mistaking the effects of inflation for the cause. One would be hard pressed to find a stupider statement than Newman's judgment on free markets: "every seller constitutes a monopoly to the degree that he has the power to increase prices without affecting sales, and such pricing institutions are not on the whole undesirable, as pure price competition would be totally disruptive of the economy" (p. 165). When literary critics are as ignorant of economic truth as this, it is hardly surprising that their economic analyses of culture are confused. Still, Newman is the only critic I know of who has understood how pervasive and insidious a force inflation has been in twentieth-century culture. 19. For a general study of the role of the simulacrum in Mann, see Berhard J. Dotzler, Der Hochstapler: Thomas Mann und die Simulakrender Literatur (München: Wilhelm Fink, 1991). 20. The idea of the simulacrum is very important in contemporary French thought, particularly in Baudrillard. In Simulations, he defines the simulacrum as "the generation by models of a real without origin or reality: a hyperreal" (p. 2), "a liquidation of all referentials ... substituting signs of the real for the real itself" (p. 4). 21. That is of course why it is easier to inflate a pure paper currency as opposed to a gold-backed currency. To see how close this situation is to the world of simulacra conceived by Baudrillard, consider his characterization: "The relation between them is no longer that of an original to its counterfeit. ... objects become undefined simulacra one of the other" (p. 97). That Baudrillard himself senses a connection between his notion of the simulacrum and paper money is shown by the fact that he often speaks of the circulation of simulacra; his description of Los Angeles, for example, is an apt characterization of the modern money supply: "a network of endless, unreal circulation" (p. 26; see also pp. 11, 32). Baudrillard makes the connection explicit when he compares the process of simulation to "the floating of currency" (p. 133). It is a curious historical coincidence that the poststructuralists' obsession in the 1970s with what they called "free-floating signifiers" roughly coincided with the end of the gold-exchange standard, which resulted in the free floating of national currencies, wholly uncoupled from any tie to gold. 22. My poststructuralist colleagues must by now be having a good laugh at my epistemological naïveté in talking about the reality of money; since all money involves an act of representation, they would argue, it is ridiculous to speak of one form of money as being more real than another, and hence I am simply mired in an archaic fetishizing of gold. But making the distinction between a pure paper currency and a gold-backed currency need not involve any essentialist claims about the metaphysical reality of one form of money as opposed to another. In this as in other areas, Austrian economics proves itself to be more subjective in its view of reality than alternate theories (especially Marxism, with its objectivist labor theory of value). For Austrian economics "real" money is simply money the market accepts on its own as real; as Mises shows, any good accepted as money must at least originally have had an exchange value independent of its use as money, that is, it must be a commodity like gold that is subjectively valued for reasons other than its use as a medium of exchange. The opposite of this kind of money is money that the government must force people to accept (legal tender laws). Thus, far from being essentialist, this distinction is purely pragmatic, simply reflecting how people in fact behave. Indeed, long after all governments have abandoned the gold standard, and even labored mightily to demonetize gold, people around the world continue to insist upon treating gold as a form of money, whereas many legal tender currencies are treated as worthless paper by people outside the authority of the governments issuing them. lf my colleagues want to persist in claiming that there is no way to view one form of money as more real than another, I have some rubles I would like to trade them at face value for Krugerrands. 23. For a discussion of this painting, and others like it by Magritte, see Suzi Gablik, Magritte (New York: Thames and Hudson, 1985), pp. 124–31. 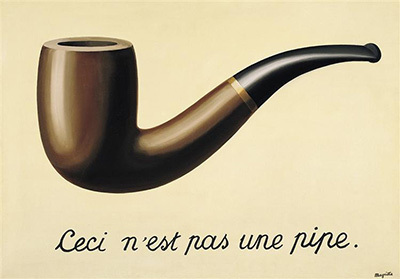 The importance of this painting to poststructuralism is shown by the fact that Michel Foucault wrote a long essay about it, published in English as This Is Not a Pipe, James Harkness, trans. and ed. (Berkeley: University of California Press, 1983). Foucault suggests several interesting ways of reading the statement "This is not a pipe." He also connects Magritte's painting to the idea of the simulacrum: "Resemblance predicates itself upon a model it must return to and reveal; similitude circulates the simulacrum as an indefinite and reversible relation of the similar to the similar" (p. 44), once again a peculiarly apt characterization of the illusory world of paper money. 24. David A. Wells, Robinson Crusoe's Money; or, the Remarkable Financial Fortunes and Misfortunes of a Remote Island Community (New York: Harper & Brothers, 1876), p. 57. This fascinating book presents a view of the evolution of money very similar to that developed by Austrian economics, and offers a cogent defense of the gold standard (unfortunately Wells's argument is weakened by his clinging to the labor theory of value and his ignorance of the law of marginal utility). I learned of this book from reading Walter Benn Michaels, The Gold Standard and the Logic of Naturalism (Berkeley: University of California Press, 1987), pp. 145–47. Michaels's book is one of the most famous examples of the so-called New Historicism, the kind of deconstructed Marxism that currently dominates literature departments, largely derived from the thinking of Foucault. Michaels develops an intriguing argument about the relation between the gold standard and the concept of representation in nineteenth-century America, in some ways similar to the line I am pursuing. But Michaels cannot take the gold standard seriously, and regards as naïve any attempt to distinguish "real" from "fake" money. On p. 147, he writes: "in insisting that 'good money' must 'of itself possess the full amount of the value which it professes on its face to possess' (p. 26), writers like Wells were insisting that the value of money as money be determined by (and indeed identical to) the value of money as the commodity it would be if it weren't money." Here Michaels reveals his ignorance of economics and his inability to follow Wells's argument. Like the Austrians, Wells argues that money must originally have been a commodity with its own value, but he is perfectly aware that it acquires a new and additional value once it starts to function as a medium of exchange. Michaels is blind to the whole point of the bimetallism controversy he is discussing; if the demonetization of silver in 1873 disastrously lowered the price of silver, as Michaels himself indicates (pp. 144, 175), then there must be a separate component in the value of any commodity serving as money that corresponds specifically to its monetary function, as all the parties to the bimetallism debate acknowledged, including Wells. Michaels's failure to understand this simple point of economics vitiates his whole argument. Given how much contemporary literary critics speak about economic matters, it is astounding how ignorant they remain of economics. 25. Thinking along the same lines, and trying to find an image for the misrepresentation involved in an inflated currency, Wells is led to imagine the twentieth-century world of the simulacrum, foreseeing the creation of ersatz products: "the painted cotton, silk, wool, and leather could be made to look so exactly like the real articles, that it was only when the attempt was made to exchange the representation for the real that the difference was clearly discernible" (p. 94). 26. In a final twist on this subject, at the time of the German inflation, Dada artists used real banknotes to create works of art in their collages. Having become virtually worthless, the "real" banknotes turned into imaginary money, one might even say play money. The Hungarian artist, Moholy-Nagy, used a 100 billion mark note in one of his collages. See John Willett, The Weimar Years: A Culture Cut Short (New York: Abbeville, 1984), p. 42. 27. This name has been given to the twentieth century by Jacques Rueff, The Age of lnflation, A.H. Meeus and F. G. Clarke, trans. (Chicago: Henry Regnery, 1964); see esp. p. 1. 28. Mann himself drew this distinction in a public address: "man braucht nicht materialistischer Marxist zu sein, um zu begreifen, dass das politische Fühlen und Denken der Massen weitgehend von ihrem wirtschaftlichen Befinden bestimmt wird" ("one does not have to be a materialistic Marxist in order to grasp that the political feeling and thinking of the masses is largely determined by their economic condition"). See "Deutsche Ansprache: Ein Appell an die Vernunft," Gesammelte Werke, 11: 871. Cantor, Paul A., "Hyperinflation and Hyperreality: Thomas Mann in Light of Austrian Economics," The Review of Austrian Economics 7, no. 1 (1994): pp. 3–29.